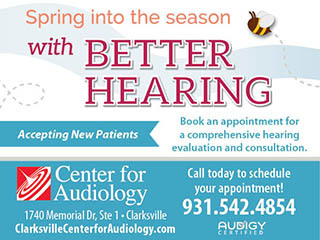 Clarksville, TN – Explosive! Electrifying! Daring! 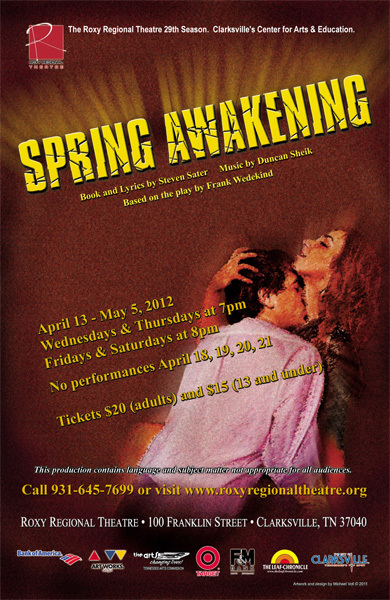 The Roxy Regional Theatre opens the landmark musical with a powerful message, “Spring Awakening”, on Friday, April 13th, at 8:00pm. Winner of 8 Tony Awards including “Best Musical,” “Spring Awakening” celebrates the unforgettable journey from youth to adulthood with a power, poignancy and passion that you will never forget. Adapted from Frank Wedekind’s 1891 expressionist play about the trials, tears and exhilaration of the teen years, this rock-infused musical has been hailed as the “Best Musical of the Year” by the New York Times, New York Post, Star Ledger, Journal News, New York Observer and USA Today. Set in a socially and sexually repressive village in 19th century Germany, this coming of age story follows teenagers Melchior (Matt DuMont), Wendla (Hannah Church), and Moritz (Gregory Pember*) on their journeys of self-discovery. Also featured are Melanie Beck, Josh Bernaski, Ryan Bowie, Regan Featherstone, Humberto Figueroa, Leslie Greene, Erin Keas, Ashley Laverty, John McDonald, Hollie Morse, Sean Ormond, Rob Rodems, Cassie Thompson and Kendall Anne Thompson. “Spring Awakening” runs April 13th through May 5th, playing Wednesdays and Thursdays at 7:00pm and Fridays and Saturdays at 8:00pm. There are no performances on April 18th, 19th, 20th and 21st. The 8:00pm performance on Friday, April 13th, is our regular pay-what-you-can preview; all tickets not pre-sold at the regular ticket price will go on sale at 7:30pm for whatever price you wish to pay.